Successfully Added Beelink M1 Windows Mini PC - Licensed Windows 10, Apollo Lake CPU, 8GB DDR3 RAM, Dual-Band WiFi, 64GB ROM, 4K Support to your Shopping Cart. The Beelink M1 is a powerful Windows mini PC that lets you turn any external display into your own personal computer. This gizmo is perfect for those of you that wish to have a compact PC at their disposal at any times. Not only does its miniature size bring along great efficiency when using it at home, it also allows you to carry it along to other places. Thanks to this, you’ll be able to have your personal and work related files at your side at any time. With its HDMI and VGA outputs, this Windows mini PC can be hooked up to virtually any display. Once connected, it lets you enjoy all the trusted Windows and Office features like any regular computer would. Windows 10 is guaranteed to treat you to an outstanding user experience. It furthermore comes with the Quad-Core Apollo Lake N3450 processor and 8GB DDR3 RAM. With this hardware at your disposal, your Windows 10 mini PC is guaranteed to handle anything you throw at it. Whether it’s games, movies, or writing up documents – the Beelink M1 supports it all. When hooked up to your TV screen, this mini PC will treat you to a true cinematic experience. With 4K and 3D movie support, you’ll be able to enjoy media like never before. Dual-Band WiFi lets you browse the web at lightning speeds. No longer will you experience a laggy internet connection while loading a page or streaming online content. Your mini PC comes with 64GB storage and a 128GB SD card slot. Together, this offers more than enough memory for you to keep all your files and media. Whether you’re at home, the office, or in a hotel – with this Windows mini PC you’ll always have your own PC at your disposal. 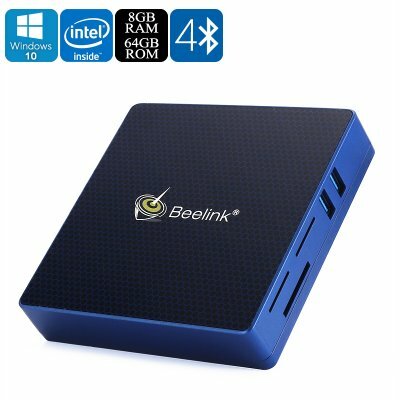 The Beelink M1 Mini PC comes with a 12 months warranty, brought to you by the leader in electronic devices as well as wholesale mini computers..